Detailed review of Dr Dennis Gross Vitamin C Serum. See what real experts and actual users have to say about this face serum. Promising to brighten and firm your face, neck, and décolleté, Dr Dennis Gross Vitamin C Serum makes significant promises to change your skin—and they deliver on them. Though the face serum has some less than desirable qualities when it comes to applying and wearing the product, the outcomes you achieve from using Dr Gross Vitamin C face serum are undeniable. This face serum greatly improves the radiance and luminosity of your face and décolleté, and even helps clear up unwanted blemishes and sun spots. If you’re looking for a Vitamin C serum that can radically change your appearance, and you’re willing to put up with a few quirky elements to the serum, then Dr Dennis Gross Vitamin C Serum is definitely worth the money. 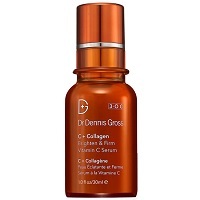 Dr Dennis Gross Vitamin C Serum is a brown, extremely thick face serum. I would say it’s not as thick as a face moisturizer, but it does have a very gel-like consistency to it. While the thickness of the face serum does comes through when you’re applying it, it does dry down and absorb to be very easy to wear under your other face products. Once it’s been absorbed, you’re left with a sticky, tightening feeling on your face, neck, and décolleté, should you choose to apply it on all three areas. It isn’t uncomfortable at all. In fact, it gives you a lifting sensation, which almost made it feel like an anti-aging serum. Application of Dr Dennis Gross Vitamin C face serum is super easy. You simply apply 1-2 pumps on clean, dry face, neck, and décolleté. If you’re only applying the serum to your face and neck, you definitely only need one pump. A little goes a long way with Dr Dennis Gross Vitamin C Serum. Once the product has dried, follow with your favorite moisturizer. It didn’t specify whether to use it once or twice a day, but unless it specifies otherwise, I always choose to apply the serum both morning and night. One thing you may want to be aware of is how much sun exposure you have during the day. Dr Dennis Gross Vitamin C Serum contains an alpha hydroxyl acid, which will make you more sensitive to the sun. So if you spend a lot of time outside, you may just want to opt for using this face serum at night only. Considering how thick Dr Dennis Gross Vitamin C Serum is, I was pleasantly surprised at how quickly it dries! I would say within 15-30 seconds you start to experience that tightening, sticky-feeling when the product has dried down. With most other serums that direct to use it on your décolleté, I normally avoid doing that because of how it feels on my chest. However, the tightening effect Dr Dennis Gross Vitamin C Serum has made it feel like it was really working on my chest, which I loved. Brace yourself for this. The smell of Dr Dennis Gross Vitamin C face serum smells almost identical to Panda Express’ Orange Peel Chicken. I know, I know… I sound absolutely crazy, but I swear it’s true! I personally hated the smell… so much so that it made me rate this serum lower than what I would have if it had a nice smell. Anyone who is sensitive to odors will definitely find this offensive, but even individuals who don’t mind smells in their products, like me, may find this to be a big turn off for Dr Dennis Gross Vitamin C face serum. Sadly, the smell lingers after you’ve applied it to your face, but it does eventually go away once you apply your morning or evening skin moisturizer on top of it. As I do with every new face serum I try, I applied Dr Dennis Gross Vitamin C face serum at night first to my face, neck, and décolleté. As I explained earlier, I immediately noticed the tightening effect it had, which I personally enjoyed. The next morning, I was really surprised to see some of my acne spots beginning to clear up. I randomly had a bunch of spots on only one side of my face, and I felt like the serum was helping to dry them out and begin diminishing them. I also noticed extremely plump skin, which is where the collagen aspect of the face serum comes in. On a more negative note, I didn’t love how the product felt on my face the next morning. I have experienced this with one other face serum before, too. It almost made my skin feel dirty—like when I rubbed my fingers along my face, I could feel product rolling into my fingers (if that craziness makes sense). So that wasn’t my favorite aspect of the wear of Dr Dennis Gross Vitamin C Serum. Despite the horrible smell and strange dirty feeling left behind on your skin, Dr Dennis Gross Vitamin C Serum delivers on the claims it makes. After using the serum for just a week, my skin was noticeably more plump, specifically on my cheeks and around my mouth, which I loved! It also helped even out my skin tone—first by helping to clear up my acne spots, and second my reducing the visibility of my sun spots. Finally, the luminosity and radiance that Dr Dennis Gross Vitamin C Serum adds to your face, neck, and décolleté is undeniable. I found myself just staring at my bare skin in the mirror. This is easily a serum that would give you the confidence to leave the house without any makeup on, which is a major win in my book. At $78.00 for an ounce, Dr Dennis Gross Vitamin C Serum is pretty middle-of-the-road as far as pricing is concerned compared to other face serums on the market. Based on its ability to actually deliver on the results it promises, and the options to use it on your face, neck, and décolleté, I definitely think this face serum is worth the money! Dr Dennis Gross has a 14-day return policy for items purchased directly on their website. To purchase Dr Dennis Gross Vitamin C Serum, click here.